I had a “why? Moment” this evening checking my Facebook Updates inbox. There was a message from BMW USA on February 20th inviting me to join their fan page. A new BMW Fan Page from the brand that just celebrated having over half a million fans is creating a whole new fan page for their U.S. team. Why? Why separate your brand into two distinct branded Facebook experiences? For those who don’t know, MINI decided last October to create an official home for the global MINI brand from zero after they already had over 160,000 fans on a MINIUSA fan page. Since that time the MINIUSA fan page has lost a few fans in their total fan count and the new official MINI brand fan page has gained over 70,000 fans. It never really made sense why MINI didn’t just assume the 160,000 fans of the USA page and then grow the official MINI global brand fan page to increase the brand’s reach and have one single destination for all fans to congregate around. 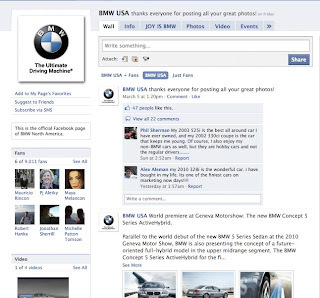 Now BMW is following the same strategy of having a distinct USA fan page from their global page, but unlike MINI, BMW had the fans already at a global fan page. Both BMW and MINI are global brands without much variation in product or even messaging and both brands had pretty decent fan numbers to continue to build from. 1. Confuses search result destination for potential fans. People who search Facebook for the brand are presented a couple options and most will likely choose the one with the larger fan base or the cleaner name – i.e. MINI, not MINIUSA. 2. The brand has to build two fan bases. The marketing of the fan page now becomes a country of origin issue and the brand now has to decide if marketing campaigns or customer communications will point people to the USA or global fan pages. Why cause this issue every time the brand goes to market their Facebook presence? It doesn’t make any sense especially when the global fan page is made up of a significant US population of fans? 3. Dividing fans reduces the overall fan count for a brand. Reducing fans by splitting them up reduces the effectiveness of the social community’s reach, since fewer fans mean fewer people getting a status update, promotion, images or other news. 4. If a communication is relevant to both groups of fans, the community managers must collaborate on messaging and also post the same content on two different pages, again an inefficiency for the brand. Seems to me if you are truly a global brand like MINI and BMW are, there is absolutely no reason to create more work by having to market, communicate and develop two distinct communities one for the USA and one for everyone including the USA. As a BMW fan, I'm definitely looking forward to seeing where it is headed. Just wondering why in an industry where everyone is moving more and more global in their brand communications why divide it all up and what it adds to the confusion of the marketing destination decision. Besides, as a fan and over 12 year owner of BMW cars, I never think of BMW as BMW USA but as BMW.